By the Waters Edge: The End of Corncrake in the Callows? The last Corncrake in the Callows is unlikely to breed successfully this year. Double brooded, its first nest would have been washed away. It should be on its second brood of eggs now, but all suitable habitat is under water. For such a short lived bird (3 years) failure to successfully fledge two broods can have devastating impacts on its population. Our bird is unlikely to fledge any young this year. 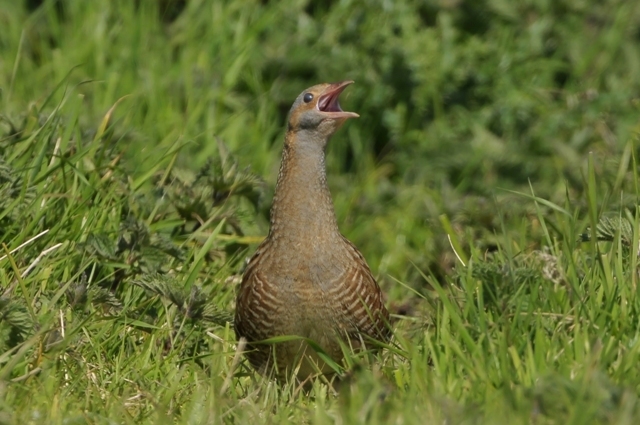 The farmers and conservationists are devastated – could this be the last Corncrake in the Callows? We won’t know until next year…. it’s going to be long wait. Check out Friday’s show of “Mooney goes wild” to hear more about the impacts of this flood on Lough Ree and the Callows. Inchinalee Island is now nearly completely under water. Luckily the famer managed to swim his cattle off safely. Against all odds, the Redshank fledged its chicks and flying juveniles were seen last week on the adjacent mainland. Breeding has finished on most sites and the birds have left. Their absence and the silence is a little eerie, especially on Inishee. Apart from a few Redshank, which should be gone this week, Snipe are all that is left. They have a longer breeding season than Lapwing, Redshank and Curlew and surveying will continue for another few weeks on their sites. Hanna the Breeding Wader Fieldworker finished up last week. A big thank you to her for all her hard work. It’s been a difficult season and I’m sure she never imagined she’d spend so much of her summer wading through food waters! Thanks for the informative article and beautiful photography.